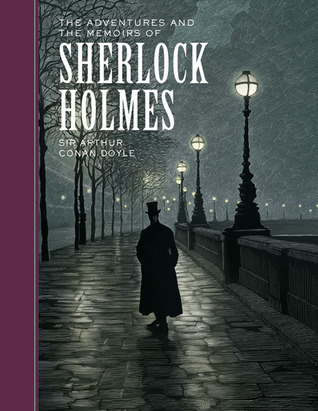 Within this book, you will find some of the best-known Sherlock Holmes stories including A Scandal in Bohemia, The Speckled Band, The Red-Headed League, and the much despised The Final Problem. These stories were published serially in a magazine before Doyle gathered them together for The Adventures and The Memoirs. It's hard to say too much about these stories that hasn't already been mentioned. I found them a perfect pick for winter. It was easy for me to sit down with a blanket and immerse myself in the dark alleys of London or the mysterious country homes with dark secrets. The mysteries are well-written and the combination of Holmes and Watson has stood up to the test of time for good reasons. Watson makes the perfect every man narrator to show us the bizarre but compelling world of the reclusive Holmes. The good detective has, of course, become an archetype for detective stories everywhere. His mind seems to work on a different level than that of the average person, as he seamlessly uses his powers of observation and his vast knowledge of science, history, and psychology to solve case after case. It was interesting for me to note that the Sherlock Holmes of Doyle's stories is a more multi-faceted character than the one we often see portrayed on TV and in the movies. He is a genius who is socially awkward and feels that he is superior to everyone he encounters. But the Holmes created by Doyle goes through many more emotions than we usually see portrayed - he is unsure of his decisions, he worries for his friend, and in rare moments he even worries for himself. This character has so much for the reader to uncover and it feels that you could spend a lifetime with him (as Watson does) and perhaps you will never really know him. I'm glad I finally read some Sherlock Holmes. The mysteries are wonderful and I feel inspired to pick up some other classic mysteries (Agatha Christie, maybe?). Sherlock Holmes and Watson are an incredible duo and I'm glad to have met them in their original incarnations. Have you read Sherlock Holmes? What is your favorite story or novel? I have never read Sherlock Holmes. I really really should do so!